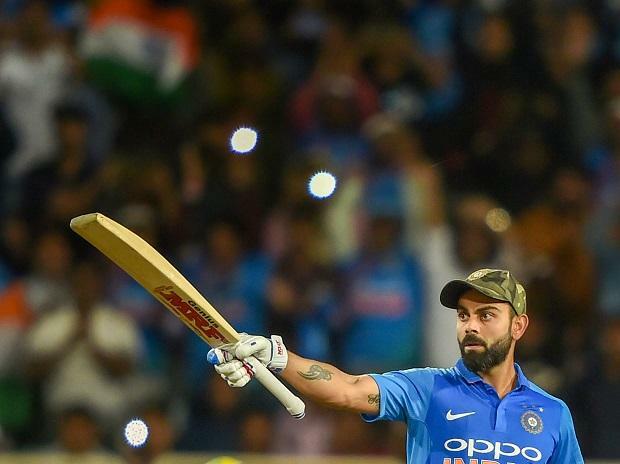 India captain Virat Kohli on Friday said his team will look to address its recent batting collapse and come back stronger in the remainder of the five-match series. Chasing Australia's stiff 313 for five, largely built on Usman Khawaja's (104) maiden ODI ton and skipper Aaron Finch's 93, India fell short by 32 runs after being dismissed for 281. ALSO READ: India vs Australia 4th ODI preview: 4 changes in Kohli's 11 for Mohali ODI? India's chase got off to a disastrous start as they lost their first three wickets with the scoreboard reading just 27 and Kohli hinted at trying out new players in the remaining two games of the series. "We don't want to see anymore collapses. We want partnerships that can get us going. Yeah we will have a few changes in the next couple of games. A little hiccup in the middle, but we will regroup and come back strongly," he said. "If we were three down with 100 needed off 13-14 overs, it was still achievable. But with five down it was difficult. No team wants to do that (lose 4-5 wickets early). "We are a team that have strung in partnerships. We haven't lost three in bunches many times. So it has happened a couple of times in the series and that is something we look forward to plugging in the next couple of games." Kohli scored a 95-ball 123-run knock but that wasn't enough to prevent India from losing the third ODI against Australia. It allowed the visitors to pull one back and keep the five-match series alive. India had earlier won the first two ODIs. The India skipper termed his 41st ODI ton as "one the finest in terms of hitting the ball", albeit it came in a losing cause here. "We are a team that has taken a lot of pride in our cricket. In terms of hitting the ball well, it was one of my finest hundreds. I was feeling well since ball one. I was really disappointed with the way I got out," Kohli said at the post-match prize distribution ceremony. After winning the toss, Indian pacers covered up commendably for a rare off-day endured by the spinners as the visitors rode on a 193-run opening stand between skipper Finch and Khawaja to pile up 313 for five. The Indian spinners -- Ravindra Jadeja (0/64 in 10 overs) and Kedar Jadhav (0/32 in 2 overs) -- had an off day but Kohli praised his bowling unit for pulling things back. "We were specially happy with the way we pulled things back in the first innings. With the way Australia were going, we thought we would have been chasing 350 plus," he said. "I was told dew would come in in the evening, but that didn't happen and I got that wrong. The wicket wasn't improving at all and wasn't getting easy for batting." Australia captain Finch, who going through a prolong lean patch before Friday's match, said he never doubted his abilities in tough times. "I have been working really hard and have always had the faith I would get runs," he said after returning to form. The Aussie skipper had special praise for Khawaja, Glenn Maxwell and pacer Jhye Richardson for their contributions. "It was a pretty good performance. To get 300 on that wicket was very good. It was nice and especially in these conditions. That partnership (between me and Khawaja) allowed Maxi (Maxwell) to come in and play his game. "Me and Usman played a fantastic knock. Jhye (Richardson) was also impressive with the ball," Finch said. Man-of-the-match Khawaja said it was a special feeling to score his maiden ODI ton against a side like India. "It is nothing like that. Specially against a very good Indian side. It was nice to get that win," he said about his century. "The bowlers bowled beautifully. We weren't quite sure what a good score is, Finchy (Finch) started well and the lower-order did a good job to take us over 300. My highest score was 98, so it was nice to get those extra runs today.